welcomes you to Jackson Hole, Wyoming. We offer adventures in horseback riding, trail riding, summer pack trips, backcountry fishing trips, and big game wilderness hunting. 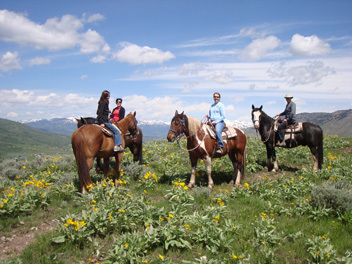 Horse Creek Ranch is comprised of the A-OK Corral Horseback Rides and Trophy Mountain / Horse Creek Outfitters, owned and operated by Dustin and Laura Child. At Horse Creek Ranch, we are leaders in wilderness adventures! Whether you enjoy horseback riding, fishing, hiking, photography, or big game hunting - we are waiting to take you on the adventure of your dreams! Please check out all our pages, and choose the adventure for you.